This review describes the statistics of health care derived from non-routine sources. The chapter on need describes local and national population studies and general morbidity surveys as well as covering a range of specific problem studies. Statistics reflecting unmet demand are described as they relate to the various stages of medical care from primary medical to patient care. Resources are described in statistics of facilities as well as the various classes of manpower employed, and the uses of services chapter covers all community and hospital services. Studies which evaluate medical care are divided into those which reflect accessibility and acceptability as well as outcome of care and satisfaction of patients, families and staff. 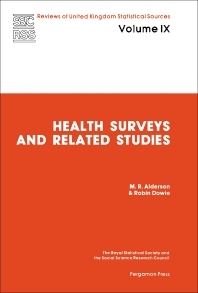 An introduction contains a discussion on the application of statistics and the concluding chapter looks towards a future unified health information system.